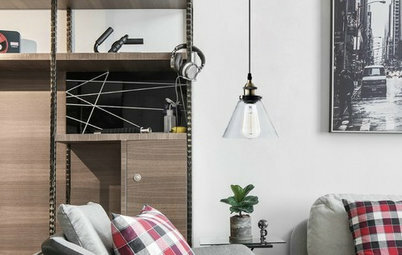 Those special spots around the home that make you pause and smile are design moments. In this series, we’re looking at these powerful features room by room and considering why we love them. 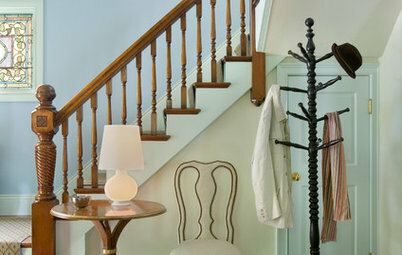 The entryway is a place where a great design moment can make a big impact. 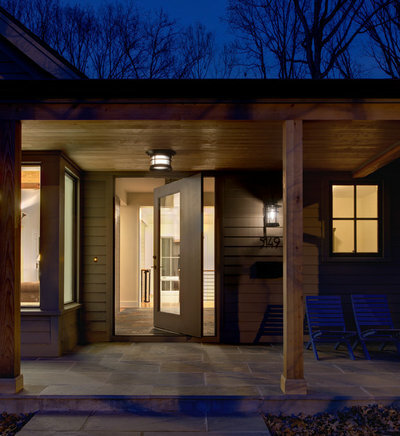 The front entry sets the tone and foreshadows what awaits inside. It’s your best opportunity to welcome visitors and delight passers-by. 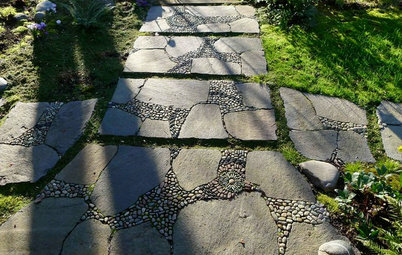 Extend your personal style down the walkway. 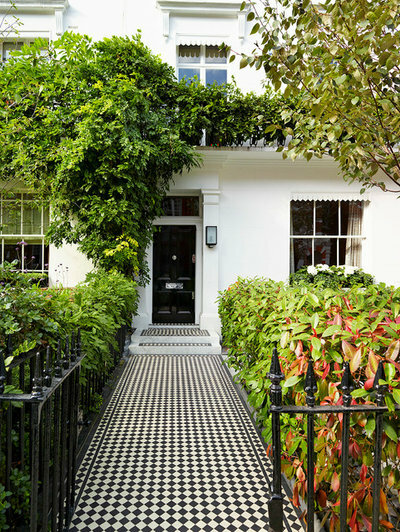 This fabulous black and white front walk acts like an inviting tile rug. 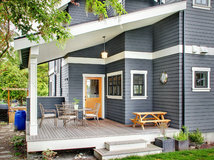 It suits the crisp white home with its glossy black door and wrought iron fence. I don’t know about you, but it makes me eager to see the inside of the house. Add a bold color. 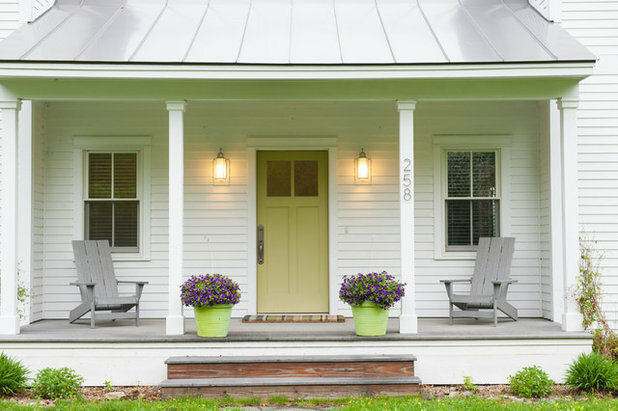 On this 8-foot-deep porch, there’s ample room for Adirondack chairs and two buckets of potted flowers. 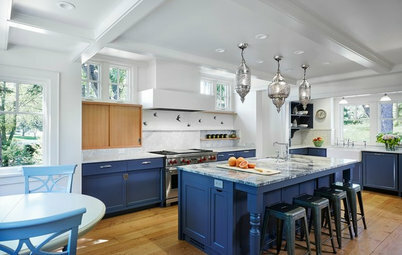 Note that matching the buckets to the door reinforces the design moment. 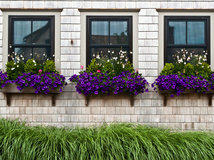 This is one of the cheapest and easiest ways to transform a home’s facade. 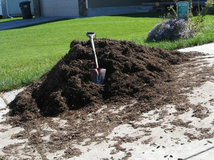 At the same time, it makes your home feel more welcoming and personable. 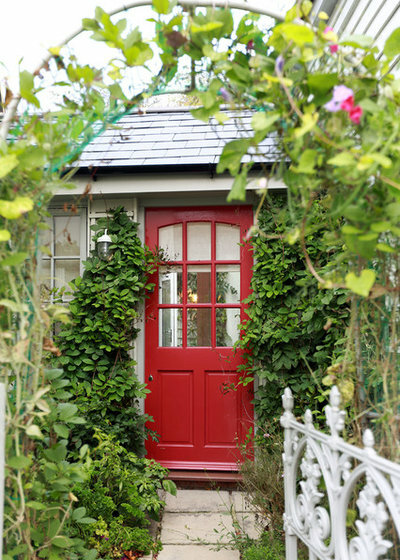 Add a charming screen door. 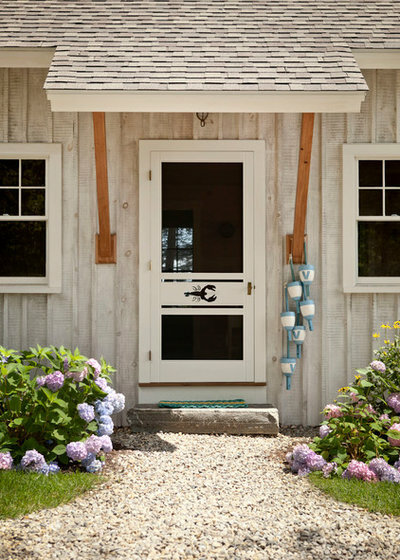 This door in Maine celebrates the local fresh cuisine while letting the breeze blow through the house. 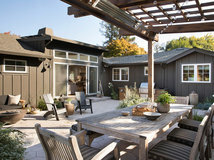 It gives the coastal home personality, while inviting folks to relax and get casual. 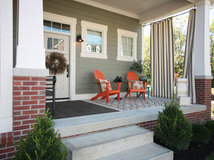 Screen door: Wooden Screen Door Co.
Punch up a portico. 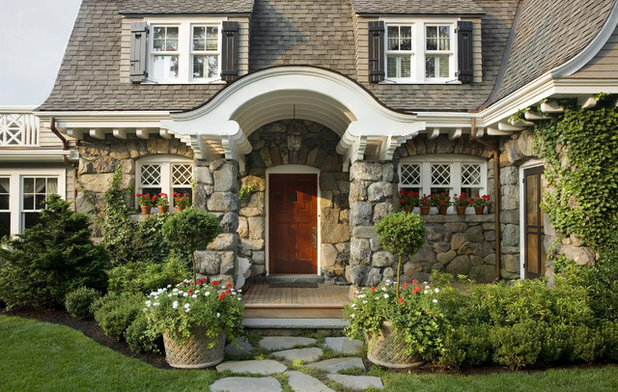 Those large stone columns, that gracefully curved roofline — this portico is welcoming and offers shelter from bad weather to anyone fumbling for keys or waiting to be ushered inside. 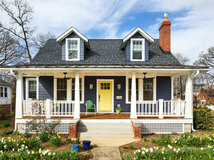 Adding a portico is a great way to dramatically change the look of your house without breaking the bank. 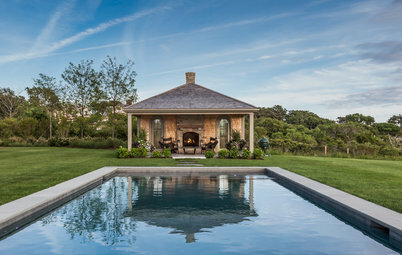 There are so many design opportunities with this one move — rooflines, columns, the material underfoot. 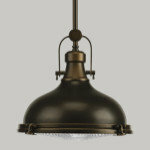 Use the ceiling to hang a light fixture, or paint it an accent color like haint blue. Treat your entry like a gallery. 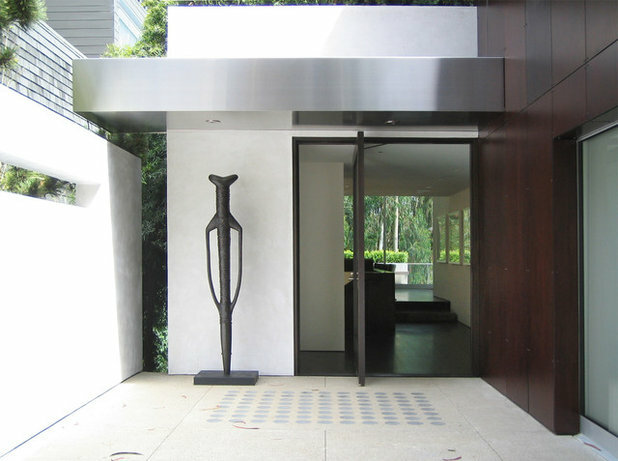 This sculpture makes a big statement next to the pivot door. Its scale is just right for the height of the overhang, and the white behind it provides the stark backdrop it calls for. Frame the door. 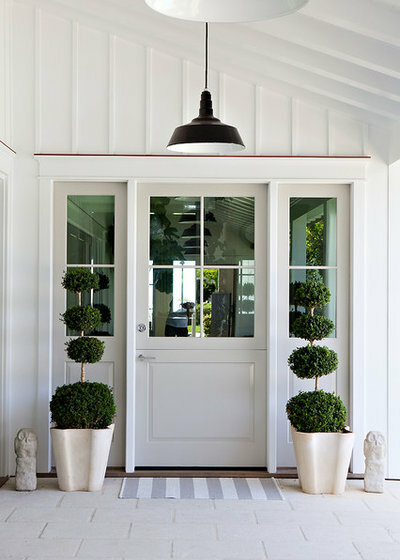 Here, playful topiaries add a formal French garden touch to the modern farmhouse simplicity of this home. They also reinforce the pleasing symmetry of the sidelights. 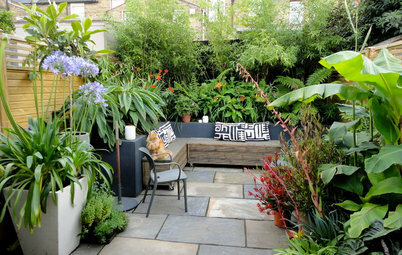 Whether it’s ferns, edibles or fanciful topiaries, flanking the door with potted plants adds life to an entry. 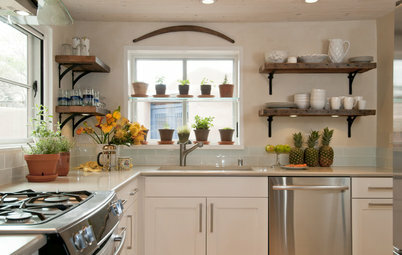 You can also make your style mark via the pots you choose. 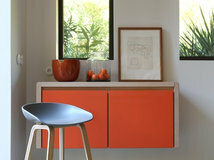 Give a midcentury preview by using bullet planters, show your love of classic gardens with urns, or choose rectilinear vessels for a clean-lined contemporary look. 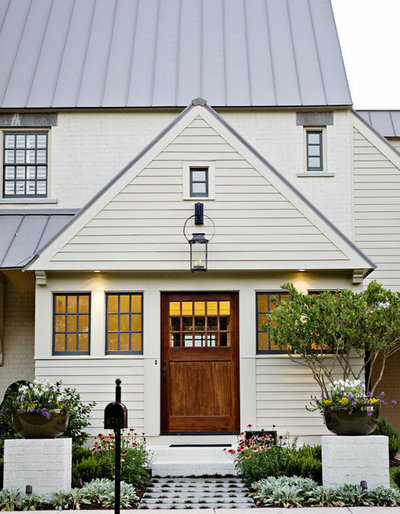 Try a unique door style. This wood and glass custom pivot door has a large presence thanks to its 5-foot width and floor-to-ceiling height. 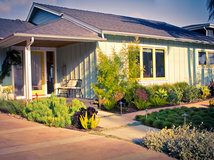 The fact that it pivots is an unexpected treat — entering a home through one is an unusual experience. 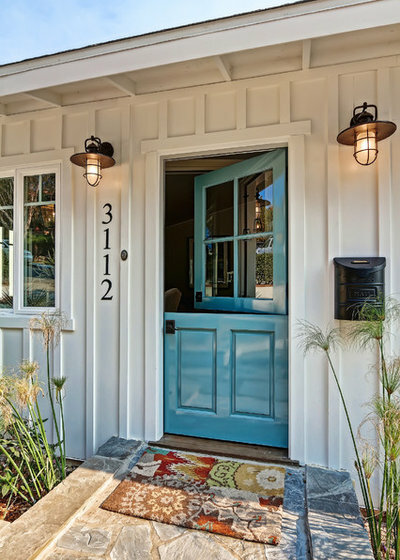 Similarly, a Dutch door enhances this beach house with good old-fashioned nostalgia. I can almost see my grandmother Mimi passing a homemade apple pie through the top portion. 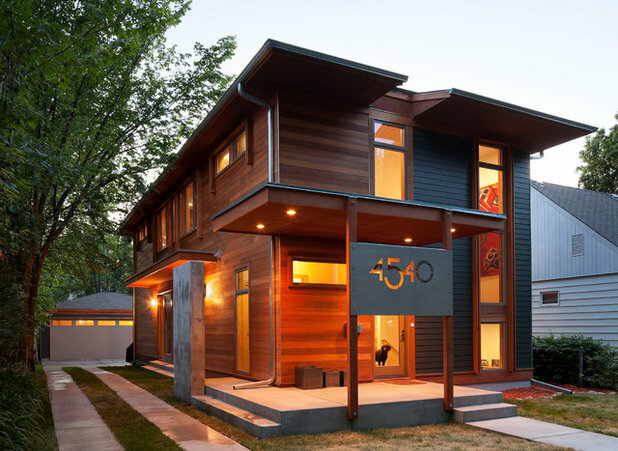 Get creative with your house numbers. A friend of the homeowners designed this unique house number panel for them. The numbers were cut into bead-blasted stainless steel. 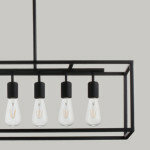 They add a graphic architectural touch. 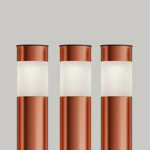 Think beyond the typical light. 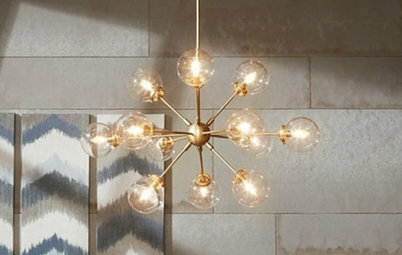 The usual sconces are always a good choice, but there are other options. This lantern hanging from a ring accentuates the architecture and adds equestrian style to the facade. Consider leaded or stained glass for sidelights, glass door panels and transoms. This home is lucky enough to have all of the above, filled in with whimsical stained glass. 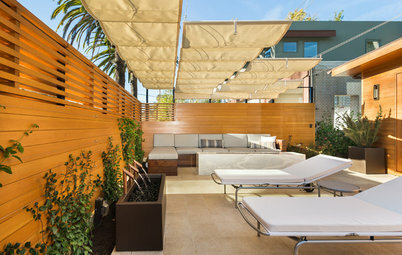 They create privacy while still letting in natural light. 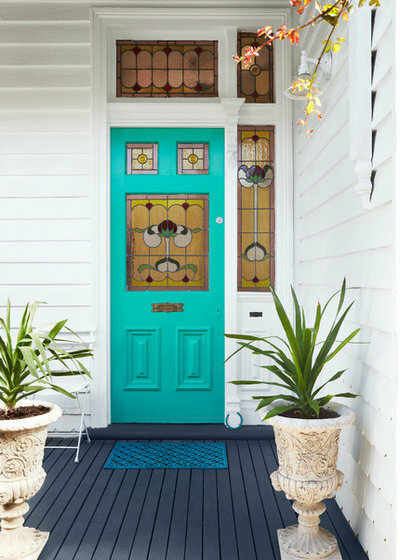 Stained glass is popular on Victorian-era homes, but it can also be used in many other styles. 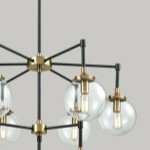 Search for local artisans who can make one for you. 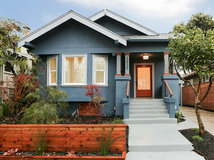 Some people opt to add an initial or incorporate their house numbers. 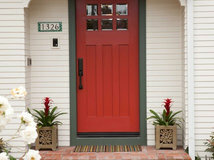 What kind of elements make a big impact at your front entry? Share your special design moments with us in the Comments. Thanks for featuring us! Great tips! 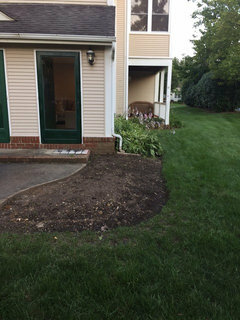 need more ideas for a townhouse front garden, porch, walkway etc to blend in but give a special punch to my small frontage. What is a good simple design?